Kent State University Press, 9780873389259, 73pp. "Found in these pages is simple profundity, desire unmitigated, the things we wish for each other, the science of absolutes so easy to understand, and so devastating: these poems put complex moments in such a straightforward context that we grasp not simply the words but the full feeling as something we have felt in some kind of similar vocabulary." 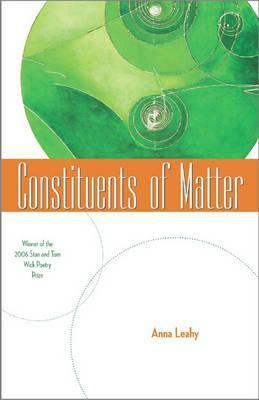 "In Constituents of Matter, Anna Leahy looks hard and long at the 'solid things' of the world and discovers that they are both reflected and refracted by time. The matter that constitutes her experience occupies a space that is 'immense' with 'emptiness' but is also 'buoyant' with 'joy.' Like the moose she looks at and who catches her looking ('Moose, Looking'), I find that I'm contained by a 'large life' that's revealed in intervals of repose and stillness." "That which occupies space; substance; experience; subject of concern, feeling, or action; difficulty; quantity; something set down in writing; from the Latin mater, mother. What matters, ultimately, in Anna Leahy's crafted cosmology, is that family, lovers, thinkers, and saints shine like stars through each and every one of her intelligent words."